Global aquaculture production has increased rapidly over the past decades; however, aquaculture systems have become more energy intensive, mainly relying on non-renewable sources. Increasing energy prices and energy cost fluctuation could make aquaculture industry vulnerable, and eventually, it would reduce food security at the local, regional, and global level. Therefore, understanding and mitigating the energy use in aquaculture is important for the sector to grow in a sustainable manner. This study aims to understand the energy intensity of various forms of aquaculture. The energy intensity of aquaculture was investigated using a modeling approach with consideration of culture species, culture system intensity, culture technology, and climatic condition. The established energy intensity model was used to estimate the energy use of current global aquaculture, and to explore possible strategies for the expansion of future global aquaculture in an energy efficient way with various growth and climate change scenarios. Results showed that a significant amount of energy use (about 100 TJ/yr) could be saved with a selective extensification of aquaculture (i.e., the increase in extensive culture systems in developing countries for all trophic levels of species, along with the increase in intensive marine-based culture systems in developed countries only for low trophic level species) compared to the baseline. Also, as warm climates are more dominant in major aquaculture producing countries by 2025, the energy intensity of future global aquaculture would be reduced. As the current world population is expected to reach approximately 8.2 billion by 2025, food production sectors will expand to meet the increasing demand . However, feeding the expected world population without depleting natural resources and damaging the environment is a grand challenge because food production sectors have grown at the expense of resources, especially fossil energy [2-4]. Therefore, one of the major research foci in food production sectors is to overcome the current dependence on fossil fuels . As one of the important food sectors, global aquaculture has been rapidly expanded and intensified at the fastest rate among the animal meat production in the period of 1970 to 2004 [6-9]. According to FAO , fish protein serves more than 2.9 billion people and comprises around 20 percent of total animal protein intake. The major energy sources used in aquaculture production are electricity and fuels (e.g., diesel and propane), which are required for pumping, aeration, heating/chilling, wastewater treatment, transport, refrigeration, and processing [11-13]. Due to globalization and intensification of food production, the aquaculture sector has become one of the most energy intensive practices in the food production [9,14]. For instance, seabass cage aquaculture requires 67 kcal of fossil fuel energy input per 1 kcal of protein output, while energy requirements for chicken and swine are only 34 kcal/kcal and 35 kcal/kcal, respectively . Considering the important role of aquaculture, energy use by the sector will continuously increase as more advanced aquaculture systems are developed to meet the ever-increasing global fish demand [14-16]. In addition, as energy intensity (i.e., energy input per kg product) and energy use in aquaculture increase, the economic viability of the sector could become vulnerable to increasing energy prices and energy price volatility . It is therefore essential to understand the current status of energy use in aquaculture, and to find strategies for the sector to maximize productivity as well as reduce its energy intensity. 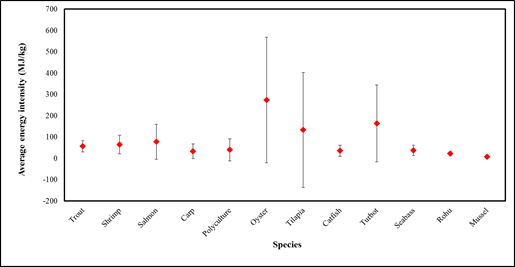 In aquaculture, energy intensity varies widely depending on farmed species or the natural trophic level of species (Figure S1 in the supporting information), system intensity (i.e., extensive, semi-intensive and intensive), culture technology, scale of production, and local conditions [2,18]. Several studies assessed the energy use of aquaculture based on estimated field data or theoretical calculations. Forchino et al. reported energy requirements of two different aquaponics techniques (raft system and media-filled beds system) used for rainbow trout and lettuce production. Yacout et al. reported energy inputs to tilapia production with intensive and semi-intensive production systems. Troell et al. investigated energy inputs to aquaculture operations in various forms of fish farms, and compared them to the energy inputs in other forms of agriculture. Pelletier et al. summarized energy intensities to produce various species from aquaculture and fisheries, and discussed on the vulnerability of seafood products to energy price changes. Colt et al. reported the resource and energy requirements of various types of hatchery systems for smolt production in the U.S. Pacific Northwest. They reported that a Flow-Through (FT) system with a gravity water supply had the lowest energy requirement (117 MJ/kg), while a Recirculating Aquaculture System (RAS) with a heating device resulted in higher energy consumption (567 MJ/kg). Jerbi et al. compared energy demands between a traditional raceway and a cascade raceway for seabass rearing in the east cost of Tunisia. They reported that a traditional raceway was less energy demanding (175 MJ/kg) than a cascade raceway (280 MJ/kg) due to lower energy requirements in water pumping and aeration during the rearing phase. Based on theoretical calculations, Grönroos et al. assessed energy use of rainbow trout cultivated in Finland with different farming methods, resulting in a higher energy requirement of a land-based farm compared to marine-based farms (e.g., funnel and cage). Pelletier and Tyedmers  compared energy use between intensive lake-based systems and pond systems in Indonesia, concluding that higher energy inputs in the pond system mainly due to the need for aeration. In these studies, estimated energy inputs were utilized for comparison either among various forms of aquaculture or with other forms of agriculture. However, no studies examined the influence of combined aquaculture factors (e.g., culture species, technology, local climate) on the energy intensity of aquaculture operations. As mentioned above, most of the information on energy requirement in aquaculture is based on field data using different approaches and assumptions. However, the characterization of energy intensity using field data can be sometimes inaccurate, because energy data are not collected in a systematic way with consideration of temporal variations on a daily or yearly basis (e.g., variations of feeding and management practices, stocking densities) [25-27]. In addition, the existing information is specific to cultivated species, culture systems, and geographical conditions, making it difficult to compare the energy intensities of different forms of aquaculture across the studies [18,21]. Thus, there is a need to investigate the effects of aquaculture factors on energy intensity systematically. To assess the effects of aquaculture factors on energy intensity, a modeling approach can be used. In aquaculture, several mathematical models have been developed and applied to evaluate effluent characteristics (e.g., nitrogen and phosphorus concentrations) from various fish farms [26,28-31]. The models have been effectively used for farm authorization, taxation, and monitoring and have saved cost, time, and labor required for water sampling . Likewise, a modeling of energy intensity of aquaculture can help understand energy use of the various aquaculture practices considering the culture species, culture system and method, and geographical contexts. Furthermore, it can be applied to investigate the strategies for reducing the energy intensity of future aquaculture. Therefore, this study aims to evaluate the energy intensity and energy use in aquaculture through a modeling approach with the consideration of culture species (represented by natural trophic level), system intensity, culture technology, and climate. The developed model was applied to investigate energy use profiles of current and future global aquaculture under various growth and climate scenarios. Aquaculture is a highly diverse activity, producing fish, mollusks, crustaceans, and aquatic plants in fresh, brackish, and marine waters with a variety of technologies. Choice of species influences energy requirement because each species requires different environmental characteristics, such as water temperature [17,18]. Also, feed conversion ratios and nutritional requirements, which are species-specific, could influence overall energy demands, especially in intensive fed aquaculture systems . The nutritional requirement can be directly related to the natural trophic level of species because low trophic level species often require less processed feed . Based on these facts, Henriksson et al. suggested a positive correlation between the energy intensity and the natural trophic level of the farmed species. System intensity (e.g., intensive, semi-intensive, and extensive systems) and culture technology can also be important factors for determining the energy requirements in aquaculture. Typically, intensive farming systems are constructed with tanks, ponds, and cages, and they can be characterized by high stocking densities, high energy inputs, heavy chemical and artificial feed inputs, and low labor inputs [17,18]. On the other hand, semi-intensive and extensive farming systems have relatively lower stocking densities, less operational energy, and artificial feed inputs. Pelleteir and Tyedmers  found that energy costs are often positively correlated with the system intensity. In addition, larger fish farms may be able to use their equipment more efficiently than smaller farms due to the economies of scale in energy use, resulting in lower energy cost per yield . However, most of the collected literature and reports did not provide scale information because this information was proprietary. As a result, the scale of production was not considered as an indicator in the model. Apart from the aquaculture-related factors, local climate conditions can also be a determinant factor for estimation of the energy demand, because environmental factors (e.g., source water temperature, ambient temperature, and solar insolation levels) can affect energy demands . For instance, shrimp aquaculture in Columbian ponds needs 70 kcal/kcal , while shrimp aquaculture in Ecuadorian ponds requires 40 kcal/kcal . Based on the information above, in this study, the four factors (i.e., species, system intensity, culture technology, and climate) were selected as possible indicators to characterize the energy intensities of various forms of aquaculture, and their significances were tested using a statistical approach. 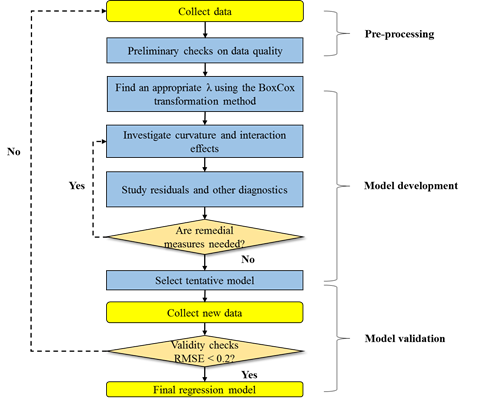 Figure 1 describes a flowchart of developing a regression model in this study. In the pre-processing step, data on energy use were collected from existing literature and technical reports. Information on the natural trophic level of aquaculture species was obtained from literature [37,38]. Since most of the explored literature and reports presented energy use as a direct energy input, direct energy input per kg fish produced was used to measure energy intensity. Data without all information needed for the considered predictors were disregarded. The collected energy use data were summarized in Table S1 in the supporting information. In the model development step, each indicator variable was centered and scaled with its mean and standard deviation, respectively. If necessary, observations (i.e., energy intensity) were transformed by the Box-Cox transformation approach to minimize error terms in the fitted model . Also, interaction and curvature effects among the indicators were investigated and included if their effects were statistically significant. Extreme outliers were identified and deleted by analyzing leverage, Cook’s distance, DFFITS, and DFBETAS. For model’s reliability, the model-building data excluding outliers contain more than 10 times the number of predictor variables . The goodness of fit of a model was measured based on the statistical significance (e.g., adjusted R2). To evaluate the appropriateness of the fitted model, plots of residuals against predictor variables and expected values were analyzed as described by Mitchell . Additional new data were collected for testing the model’s predictability. Among them, three data were obtained from existing facilities in Florida, which were an intensive RAS and an extensive RAS (aquaponics) for red drum production in Sarasota [12,41], and an intensive RAS (aquaponics) for tilapia production in Lakeland , respectively. Through interviews with local farm managers, daily energy consumptions in the existing facilities were estimated based on installed equipment (e.g., pumps, blowers) and operating hours [12, 41]. The root mean square error (< 0.2) was used as a statistical indicator for the model validation. Geographic Information System (GIS) data for current global aquaculture distribution and climates were obtained from the National Aquaculture Sector Overview (NASO) map  and the Köppen-Geiger climate classification map , respectively. The NASO map is a GIS tool published by Food and Agriculture Organization (FAO), and illustrates geographical distribution of aquaculture, including the geographical locations of individual farms, culture species, technology used, systems intensity, environments, farm production, except for energy consumption. Currently, the NASO map provides data for 21 countries, including major aquaculture producers of China, Chile, Bangladesh, Japan, and so on. However, some major fish producing countries (e.g., India and Indonesia) were not included in the study due to a lack of available data from the NASO map. The Köppen-Geiger climate classification map is a world map based on temperature and precipitation observations for the period of 1951 to 2000, depicting a world climate with 5 climate classes of tropical, arid, temperate, cold, and polar climates. Due to overlapped temperature ranges used for climate classification and to facilitate the use of the energy intensity model, the 5 climate classes were re-grouped into a warm climate zone (arid, tropical, or temperate) and a cold climate zone (cold or polar) (Figures S2-3 in the supporting information). The collected global aquaculture information from the NASO map was categorized with combined factors of culture species, culture technology, system intensity, and climate as listed in Table 1. Based on the categorized global aquaculture data, energy use of current global aquaculture was estimated using the energy intensity model developed in this study. 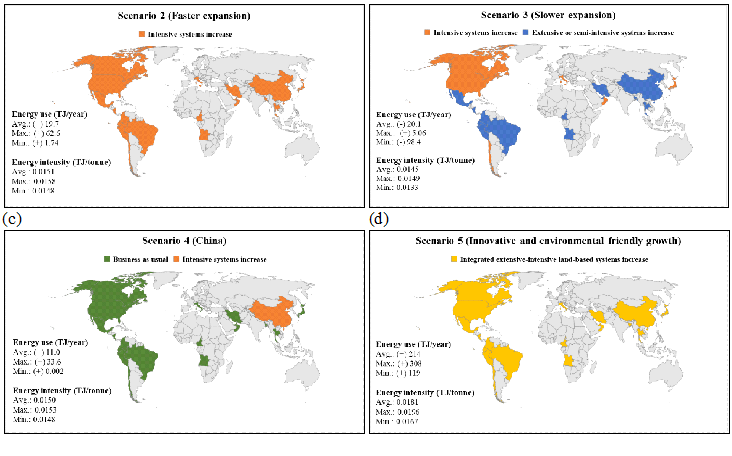 To investigate future energy use profiles in aquaculture, five global aquaculture growth scenarios were adapted from Delgado et al. and Msangi et al. . The first scenario assumed all aquaculture would be equally expanded as business as usual (baseline). The second scenario considered the accelerated growth of aquaculture with efficient and intensive fish production technologies in all countries due to global information sharing. In contrast to the second scenario, the growth of aquaculture was assumed to be delayed in developing countries (the third scenario). This is because the new production technologies require skilled experts and fish farmers in developing countries cannot afford to adopt the cost-intensive new technologies. China has currently the largest share of aquaculture production , and it would greatly influence energy use in global aquaculture. Therefore, the fourth scenario considered that fish demand in China would be more aggressively increased so that more intensive systems would be needed to meet the increasing fish demand. The fifth scenario considered the global expansion of some innovative RASs, such as integrated RASs with ecosystems for wastewater treatment and aquaponics . These systems are categorized as extensive land-based systems in this study. More details on the aquaculture growth scenario are discussed in S2 in the supporting information. · Information on technology is shared across the world. · Fish farmers worldwide would prefer intensive systems to extensive or semi-intensive systems due to higher production yields (3% annual growth rate assumed). · Sharing of information on technology across the world is delayed. · Extensive or semi-intensive systems would be more preferred in developing countries (1% annual growth rate assumed). · Intensive systems would be more preferred in developed countries (1% annual growth rate assumed). · Increase in intensive systems in China (3% annual growth assumed). · Increase in integrated extensive land-based systems worldwide (30% of fish demands in each region are met by the extensive land-based systems). · Other assumptions are the same as baseline. Note: The aquaculture growth scenarios were adapted from Delagado et al. (2003) and Msangi et al. (2013). An annual growth rate for the baseline scenario was obtained from Delagado et al. (2003) and Msangi et al. (2013), while annual growth rates for alternative scenarios were assumed in this study. Table 2 describes key assumptions for the five scenarios. Total future aquaculture production is assumed to be the same across the scenarios. Except for the baseline scenario, the scenarios 2 to 4 included various cases with different assumptions related to the natural trophic level of culture species and culture technology. For instance, scenario 2 (faster expansion with intensive culture systems) had 9 different cases, including an increase in all intensive systems, an increase in intensive systems to raise high trophic level species with all types of culture technologies, an increase in intensive systems to raise high trophic level species with only one culture technology (marine-based, land-based, or pond), an increase in intensive systems to raise low trophic level species with all types of culture technologies, and an increase in intensive systems to raise low trophic level species with only one culture technology (marine-based, land-based, or pond). Similarly, scenarios 3 (slower expansion with extensive or semi-intensive culture systems), 4 (increase in intensive culture systems in China), and 5 (i.e., integrated extensive land-based aquaculture expansion scenario) included 81, 9, and 3 different cases, respectively. Energy use in aquaculture for all cases was investigated. In addition to the growth scenarios, global climate change is also expected to influence energy use in aquaculture . Therefore, along with the aquaculture growth scenarios, two distinctive climate change scenarios (A1F1 and B1) for the period of 2001 to 2025 were adapted from Rubel and Kottek . Scenario A1F1 assumes a world with fast economic growth (fossil fuel intensive) and a quick emergence of new and efficient technologies, leading to the greatest shift of climate zones (about 6.3% increased coverage of warm climate zones). On the other hand, scenario B1 considers a world with the implementation of clean technologies, which results in the least shifts of climate zones (only 2.8% increased coverage of warm climate zones). The distribution of climate zones for scenarios A1F1 and B1 were available as GIS maps provided by Rubel and Kottek . Therefore, along with the growth scenarios, the GIS maps for scenarios A1F1 and B1 were utilized to investigate future global aquaculture distribution under different climate conditions and their energy intensities as a result of climate change. For model development, data were collected from 19 countries within tropical, arid, temperate, and cold climate zones, 15 different species including salmon (25%), trout (14%), carp (14%), tilapia (11%), catfish (8%), shrimp (8%), polyculture (carp, tilapia, mullet, and catfish; 7%), bass (3%), rohu (3%), eel (1%), oyster (1%), perch (1%), prawn (1%), and mussel (1%), 7 culture technologies including ponds (40%), RAS (23%), cage (19%), FT systems (12%), net-pen (3%), long-line (1%), and funnel (1%). The majority of the production systems in the data set were intensive systems (66%), followed by extensive (5%), and semi-intensive (4%) systems, respectively. 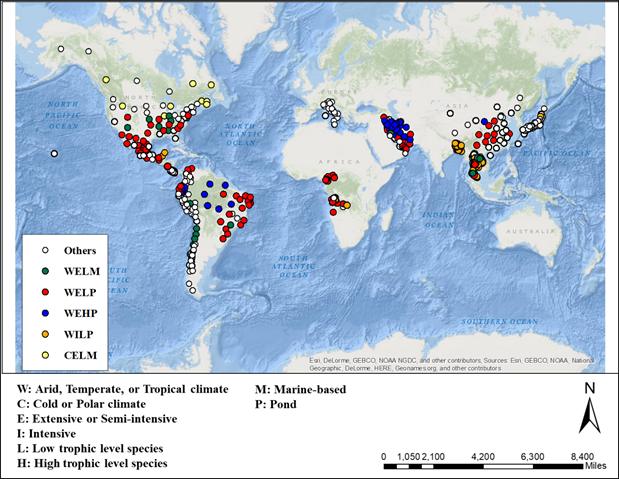 In terms of climates, aquaculture within warm climate zones (tropical, arid, and temperate) accounted for 91.3% while the rest (8.7%) were within cold climate zones (cold and polar). Data quality varied in terms of scope, reliability, and accuracy. Fourteen out of total 106 data points were disregarded due to poor data quality and inaccuracy. Ninety-two data points were initially used as a training set and 25 data points were utilized for model validation. 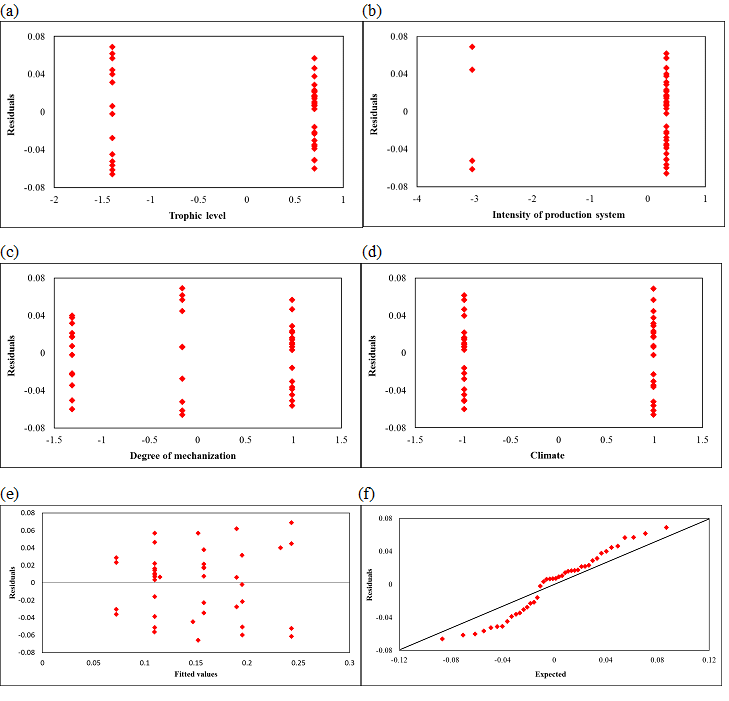 During the model development, outliers were detected and deleted to improve the predictability of the regression model. No significant interaction and quadratic effects were identified. More details for model development can be found in Section S.4 in the supporting information. As a result, the fitted regression model was developed with 42 data points which is greater than 10 times the number of predictor variables in the model. The established regression model is provided in Eq. 1.
where, EI is the energy intensity as MJ/kg produced, NTS is the natural trophic level of species (high trophic level =1 and low trophic level = 0), SI is the system intensity (intensive = 1 and semi-intensive or extensive = 0), CT is the culture technology (land-based RAS or FT = 3, Pond = 2, and marine-based technologies = 1), and C is the climate (cold climate =1 and warm climate = 0). All of the indicator variables were statistically significant at a 0.05 significance level (Table 3). Diagnostic residual plots against fitted values and a normal probability plot can be found in Figure S4 in the supporting information. Figure 2 indicates that predicted energy intensity values agree well with observations, showing the root mean square error and the normalized root mean square error of 0.08 and 0.18, respectively. Also, the adjusted R2 value is 0.97. 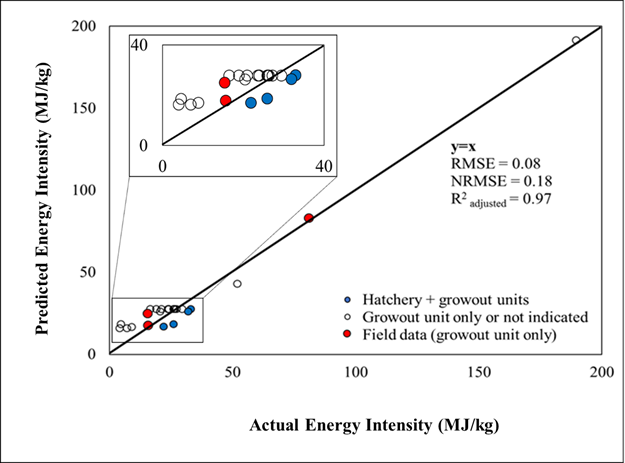 As shown in Figure 2, the model tends to underestimate energy intensity for systems with only a growout unit (i.e., empty and red circles in the figure) and overestimate energy intensity for the systems with both hatchery and growout units (i.e., blue circles in the figure). This may be because most of the data used for model development did not clearly distinguish whether the energy inputs are used for the systems with only a growout unit or for both hatchery and growout units. Additional data which contain detailed energy use information for both hatchery and growout units may improve the model’s predictability for different systems. The established model was used to predict the energy intensity of aquaculture under various culture conditions. The global distribution of current major aquaculture (i.e., fish production is over 5% of the total global aquaculture production) is shown in Figure 3, in terms of climate, system intensity, natural trophic level of species, and culture technology. Most of the aquaculture practices are performed in warm climates using extensive or semi-intensive culture systems (34,954,460 metric tons, 72% of total global aquaculture production). In warm climate regions, a total of 7,953,839 metric tons (i.e., 16% of total global aquaculture production) are produced using intensive culture systems as a major culture system of the regions, including the United States (232,635 metric tons, 52%), Angola (159 metric tons, 54%), Peru (28,083 metric tons, 65%), Colombia (44,088 metric tons, 70%), Chile (642,089 metric tons, 74%), Bangladesh (699,910 metric tons, 76%), Thailand (937,188 metric tons, 79%), Italy (150,702 metric tons, 87%), Oman (175 metric tons, 88%), Japan (1,110,284 metric tons, 99%), and Malta (4,450 metric tons, 100%). On the other hand, a relatively small amount of fish production is found in cold climate (only 12% of total global aquaculture production), which is mostly located in China, Canada, and the U.S. Among them, about 93% is produced from extensive or semi-intensive culture systems. Note: W: warm climate, C: cold climate, I: intensive: E: semi-intensive or extensive, H: high natural trophic level species, L: low natural trophic level species, P: pond, L: land-based, and M: marine-based; No production case using CEHL was identified. Table 4 shows aquaculture production and estimated energy use of current global aquaculture by culture cases (i.e., the combined model indicators, for example, WELP represents warm climate (W) extensive or semi-intensive systems (E) for low trophic level species (L) using pond (P) technology). Annual energy use and production of aquaculture were approximately 720,991 TJ and 48,707,952 metric tons, respectively. Since these data did not include some large aquaculture producing countries (e.g., India, Indonesia, and Vietnam), the estimated total global aquaculture production was much less than world total aquaculture production reported by FAO , which was 73,783,725 metric tons. Also, the NASO map may not reflect all of the fish production capacity from each country as it mainly relies on voluntary participation of fish farmers. As a result, the amount of aquaculture production from China estimated in this study (42,669,806 metric tons) was lower than the annual fish production from China (45,468,960 metric tons) reported by FAO . Although the NASO map data does not represent the exact fish production capacity from each country, the information was still useful as a basis to estimate energy intensity of global aquaculture using the model developed in Section 3.1. According to Table 4, intensive land-based culture systems for high trophic level species production under cold climate (i.e., CIHL) have the highest energy intensity (192 MJ/kg) due to the high energy requirement for heating and operation of equipment to maintain intensive culture conditions under cold weather. On the other hand, due to less energy use for heating and farm operation, extensive or semi-intensive marine-based culture systems for low trophic level species production under warm climate (i.e., WELM) have the lowest energy intensity (9.6 MJ/kg). Despite the low energy intensity (12.7 MJ/kg), extensive or semi-intensive pond systems to raise low trophic level species in a warm climate (WELP) have the highest energy use (204,017 TJ/yr) due to the largest production scale, which accounted for approximately 33% of the total global aquaculture production. For the same reason, WELM (i.e., extensive or semi-intensive systems for production of low trophic level species in warm climate using the marine-based technology) has the second highest energy use (153,599 TJ/yr). On the other hand, WILP (i.e., intensive pond systems for production of low trophic level species under warm climate) produces only 10% of the total global aquaculture production, but it has the third largest energy use (137,381 TJ/yr), due to the higher energy intensity requirement in intensive farming than extensive farming. Based on the results, energy use of current global aquaculture was found to be strongly influenced by the use of extensive marine-based technologies or ponds. Due to their low energy intensities, aquaculture is often considered as a low energy consuming practice, compared to other energy intensive industries . However, total energy use in aquaculture will further increase since global fish demand will continuously rise as the world population increases. According to FAO , global fish demand is projected to increase at about 3% per year over the period from 2017 to 2025. To meet the increasing global fish demand, aquaculture systems may change to be more intensive and mechanized to maximize production efficiency . For instance, intensive land-based RAS have been rapidly increasing in the United States . However, such systems require large energy inputs mainly due to pumping, heating/chilling, and wastewater treatment. On the other hand, the expansion of extensive culture systems (less energy intensive) was not recommended due to its side effects, such as the transformation of mangrove areas . Considering these constraints, aquaculture has to find a way to maximize productivity in an energy efficient and environmentally friendly way. Recently, an integration of natural systems (e.g., wetlands and mangroves) or hydroponics with intensive culture systems has gained attention as an alternative RAS [15,41]. The systems can produce fish as much as the typical land-based intensive RASs, while require lower energy inputs by relying on natural systems for wastewater treatment. This type of systems can be categorized as extensive land-based systems (i.e., -E-L) in Table 4, which accounted for only 0.32% of total global aquaculture production. When comparing energy use between extensive and intensive land-based culture systems, intensive land-based culture systems have energy use about 5 times larger (14,016 TJ/yr) than that of extensive land-based culture systems (2,875 TJ/yr), although the production scale of intensive land-based culture systems is only about 1.5 times greater. This means a considerable amount of energy use can be saved by reducing the energy intensive culture systems or replacing them with more energy efficient culture systems. In addition to energy use, the choice of aquaculture system can result in different environmental impact consequences. For instance, intensive shrimp farming systems showed almost twice environmental impacts than semi-intensive farming, mainly due to higher energy use and higher nutrient concentration in effluents . On the other hand, land-based RAS had lower environmental impacts than marine-based culture systems (e.g., net pen) in eutrophication emission and biodiversity conservation . Considering this, global aquaculture should be expanded in energy efficient and environmentally friendly ways. Figure 4 shows the fish production, energy use, and energy intensity of major aquaculture practices in each region. More details on annual fish production from each country can be found in Figure S5 in the supporting information. In terms of the energy intensity of aquaculture by regions, Europe and Central Asia (ECA) has the highest energy intensity (0.032 TJ/tonne), followed by North America (NAM), Southeast Asia (SEA), South Asia Region (SAR), Japan (JAP), Latin America and Caribbean (LAC), Sub-Sahara Africa Region (AFR), Middle East and North Africa (MNA), and China (CHN). In general, the high energy intensity is attributed to the large percentage of intensive culture and/or land-based systems. For instance, major practices in ECA are intensive marine or land-based culture (WILM and WIHL), which accounted for about 61% of total aquaculture production in the region. On the other hand, major practices in CHN and MNA (i.e., countries with the lowest energy intensities) are extensive marine-based or pond culture, which accounted for 80% and 82% of total aquaculture production in the regions, respectively. In addition, choice of culture species showed a significant impact on energy intensity. For instance, most of the cultured species in Japan have low natural trophic levels (85%), which produced from intensive marine-based culture systems. The energy intensity in the region (0.020 TJ/tonne) was less than that of NAM (0.028 TJ/tonne), which used the same culture systems but for high natural trophic level species (66%). According to Figure 4, energy use of aquaculture increased as the production scale increased. As expected, China had the largest production among countries and country groups, consequently the highest energy use, even it had the lowest energy intensity (0.014 TJ/tonne). However, some cases showed that energy use was not proportional to the production scale due to the influence of the energy intensity. 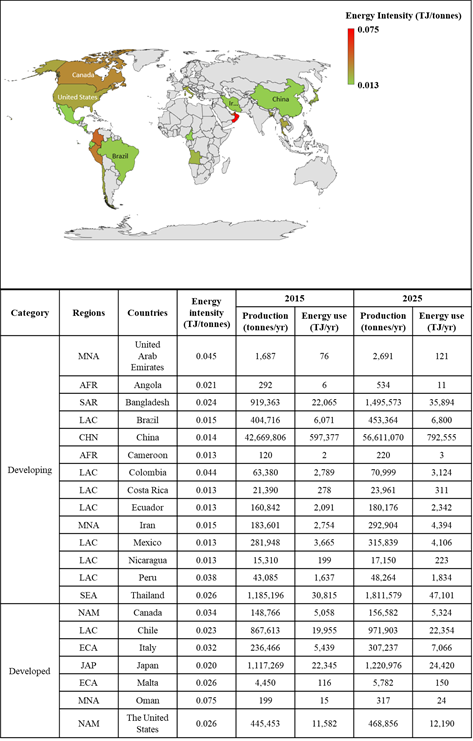 For instance, annual fish production in developing countries in LAC (i.e., 990,671 metric tons from Brazil, Colombia, Costa Rica, Ecuador, Mexico, Nicaragua, and Peru) was greater by 7.2% than that of SAR (919,363 metric tons from Bangladesh), but its energy use was lower by 32% (Figure S5 in the supporting information). This is because fish farms in the developing countries in LAC have a lower energy intensity of aquaculture (0.017 TJ/tonne) than that of SAR (0.024 TJ/tonne). Therefore, for an energy efficient growth of future global aquaculture, it is important for major fish producing regions to maintain low energy intensity (e.g., CHN), while for other regions, such as ECA and NAM, to reduce their energy intensity. The total global aquaculture production is projected to increase by about 32%, from 48,707,952 metric tons in 2015 to 64,455,978 metric tons in 2025. Expected annual production in 2025 from each country can be found in Figure S5 in the supporting information. Figure 5 shows the predicted energy intensities of global aquaculture in 2025 for the 5 aquaculture growth scenarios as described in Section 2.2 (Table 2). Energy uses in the figure were shown as relative differences from the estimated annual energy use when global aquaculture grows under the business as usual scenario (954 TJ/yr). 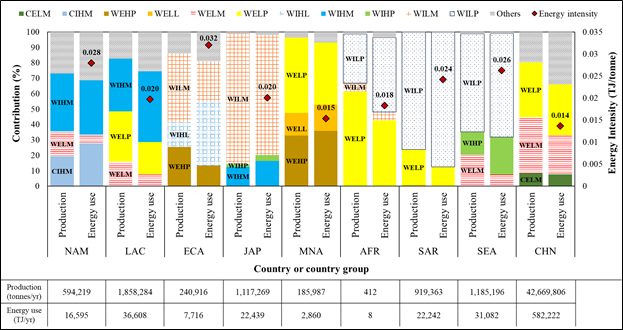 Average energy use in the figure indicates the mean energy use, considering all of the cases which were considered in each growth strategy scenario. Maximum and minimum energy uses in the figure are the estimated energy uses based on the specific cases of the growth strategy scenario. For faster expansion scenario, the highest energy use (+62.6 TJ/yr) was estimated when increasing intensive culture systems for all trophic levels of species, while the least energy use (+1.74 TJ/yr) was predicted by increasing intensive marine-based culture systems only for low trophic level species. The mean annual energy use for faster expansion scenario was 973 TJ/yr, which was higher than that of the business as usual scenario by 19.7 TJ. For slower expansion scenario, the highest annual energy use was slightly larger than that of the business as usual scenario (about +5.1 TJ/yr) when increasing intensive culture systems for all trophic levels of species in developed countries, and extensive or semi-intensive pond systems only for high trophic level species in developing countries. On the other hand, the minimum energy use case was much less than that of the business as usual scenario (-98.4 TJ/yr) if intensive marine-based culture systems increased only for low trophic species in developed countries, along with the extensive or semi-intensive culture system increased for all trophic levels of species in developing countries. The average annual energy use for slower expansion scenario was 933 TJ/yr, which was lower than that of the business as usual scenario by 20.1 TJ. Due to the large production scale in China, change in the distribution of culture systems in the country resulted in a significant energy use increase compared with the business as usual scenario. The maximum annual energy use case occurred when intensive culture systems (with all types of culture technologies) increased for all trophic levels of species (+33.6 TJ/yr). However, an increase in intensive land-based culture systems only for high trophic level species in China resulted in the minimal annual energy use variation (+0.002 TJ/yr). This is because current Chinese aquaculture largely relies on extensive or semi-intensive culture systems for low trophic species production (Figure 4). Thus, increasing intensive culture systems for high trophic level species led to the negligible variation. The average annual energy use for China scenario was 965 TJ/yr, which was higher than that of the business as usual scenario by 11 TJ. Scenario 5 was to increase in integrated extensive land-based culture systems to meet 30% of aquaculture production. Since land-based culture systems require relatively higher energy intensities than other types of culture systems, increasing land-based culture systems across the world resulted in much larger annual energy use than that of the business as usual scenario. The highest annual energy use (+308 TJ/yr) was found with an increase in extensive land-based culture systems only for high trophic level species. For this growth scenario, the least annual energy use was still higher than that of the business as usual scenario by 119 TJ/yr, which considered an increase in extensive land-based culture systems only for low trophic level species. The average annual energy use for the scenario 5 was 1,167 TJ/yr, which was higher than that of the business as usual scenario by 214 TJ. Among the growth scenarios, the integrated extensive land-based system expansion scenario (5) had the highest average energy intensity, followed by faster expansion scenario, China scenario, and slower expansion scenario. This is because the land-based culture systems are increased across all 3 cases in the scenario 5 which have higher energy intensity than pond or marine-based culture systems. China scenario (scenario 4) showed comparable energy intensity to faster expansion scenario due to the increased intensive systems across all 9 cases in both scenarios. Slower expansion scenario had the lowest average energy intensity than other growth scenarios due to the combined growth strategy (i.e., extensive culture systems for developing countries and intensive culture systems for developed countries). Based on the results, the lowest energy use of future global aquaculture can be achieved by increasing less energy intensive culture systems in the large aquaculture production regions (e.g., CHN) and energy intensive but more productive culture systems in the small aquaculture production regions (e.g., ECA). Specifically, energy use in global aquaculture would be greatly reduced as more fish are produced from intensive marine-based culture systems for low trophic level species in developed countries and extensive culture systems for all trophic levels of species in developing countries as seen in the slower expansion scenario. The importance of the selective extensification of global culture systems to reduce the energy use and greenhouse gas emissions was also addressed by Johnson et al. . Meanwhile, a change of fish production method in China showed a large energy intensity increase compared to the baseline scenario due to the largest contribution of China to global aquaculture production. Therefore, it seems that advances in technologies and management to improve energy efficiencies in Chinese aquaculture while reducing the energy intensity of fish production in other regions would be important for future global aquaculture growth. In addition to the various growth strategies for aquaculture, climate change can have a significant impact on energy use of aquaculture. Therefore, the most energy efficient growth strategy should be determined by considering the trend of climate change for future. Figure S6 in the supporting information shows future aquaculture classified by culture systems and climate zones corresponding to the climate conditions in 2025 predicted based on the B1 and A1F1 climate change scenarios. Affected aquaculture sites by climate change include China, Japan, the United States, LAC (Chile and Peru), MNA (Iran), and ECA (Italy). As a result, the A1F1 climate change scenario showed a 4% increase in warm climate zone and a 40% decrease in cold climate zone, compared with the current climate condition. On the other hand, the B1 climate change scenario showed a 1% decrease in warm climate zone and a 9% increase in cold climate zone. Based on the two future climate change scenarios, energy use of future global aquaculture was re-estimated with the various growth strategies (Table 5). In general, it was observed that warm climate zones would be more dominant in major aquaculture producing countries by 2025, leading to the reduced energy intensity of global aquaculture production. For both climate change scenarios, the lowest energy use was found with slower expansion scenario, followed by faster expansion scenario, China scenario, and integrated extensive land-based system expansion scenario, similar as discussed in Section 3.3.1. When compared to the energy use results of different growth strategies without climate change (Figure 5), the B1 scenario showed reduced energy uses by about 3.9 TJ/yr for all growth strategies while the A1F1 scenario resulted in lower or higher energy uses depending on growth strategies. Although the B1 scenario showed a slightly reduced warm climate zone area than no climate change scenario, it led to the less energy uses for all growth scenarios because energy intensities decreased in major aquaculture production countries due to the climate alternation. For instance, with the maximum energy use case in the slower expansion scenario, 54,705 metric tons of annual fish in the U.S., which were typically produced under cold climate conditions, shifted to warm climate conditions by 2025. Also, about 330,720 metric tons of fish in China were produced under warm climate conditions by 2025 instead of cold climate conditions. For A1F1 climate change scenario, the average energy uses were also lower than those without climate change by 10-15 TJ/yr for different growth scenarios. However, the slower expansion with the A1F1 climate change scenario showed a higher average annual energy use (961 TJ/yr) than the scenario without climate change (934 TJ/yr). Unlike the results with the B1 scenario, the A1F1 scenario resulted in more aquaculture production under cold climate conditions in China, although the scenario showed a larger dominant area of warm climate zones globally compared to the B1 scenario. For instance, considering the slower expansion with the A1F1 climate change scenario, about 81,015,020 metric tons of additional fish were produced under cold climate conditions by 2025, compared to the amount of fish production under cold climate conditions in the scenario without climate change. As a result, the energy intensity of Chinese aquaculture was higher (0.0142 TJ/tonne) than those of B1 scenario (0.0136 TJ/tonne) and the scenario without climate change (0.0137 TJ/tonne). Due to the largest contribution of Chinese aquaculture (about 88% of total global aquaculture in this study), the average annual energy use of slower expansion scenario was much higher under the A1F1 climate prediction (0.0149 TJ/tonne), compared to that of slower expansion scenario without climate change (0.0145 TJ/tonne in Figure 5-(b)). Note: Scenario 1 is business-as-usual, Scenario 2 is faster expansion, Scenario 3 is slower expansion, Scenario 4 is China, and Scenario 5 is integrated extensive land-based system expansion. This study investigated the energy intensity of aquaculture using a modeling approach with the key aquaculture factors of the natural trophic level of species, culture technology, system intensity, and climate. All the indicators were found to be statistically significant and the developed energy intensity model showed an acceptable predictability. Using the energy intensity model, the energy use of global aquaculture was investigated, based on current and future global aquaculture distributions as well as climate change. China accounted for the majority of total energy use in current global aquaculture due to its large production scale. Energy burdens of future global aquaculture were dependent on the growth strategy. For instance, with the selective extensification of aquaculture (i.e., the increase in extensive culture systems in developing countries), approximately 100 TJ of annual energy use could be saved, compared with the 2025 baseline scenario. On the other hand, the increase in intensive systems in aquaculture worldwide to maximize production efficiency would make the sector more energy intensive (up to +62.6 TJ/year compared to 2025 baseline scenario). Therefore, a careful consideration should be given to the aquaculture expansion, especially for large aquaculture producers, such as China and Latin America and Caribbean (LAC) regions. The A1F1 climate change scenario could alleviate energy burdens compared with the scenarios of no climate change and B1, due to the lower energy intensity for fish production under warm climate conditions. However, the impacts of climate change on the energy use of future aquaculture should be further investigated with more accurate global aquaculture data for other major aquaculture producers (e.g., India and Indonesia). The proposed energy intensity model can be a useful tool for policy makers to provide insights into modeling and developing energy strategies in global aquaculture. Future models can be integrated with life cycle assessment and system dynamics approaches to evaluate environmental impacts and investigate dynamic interactions among economic factors, environmental impacts, and social aspects. This publication was recommended by the Aquaculture Review Council and funded, in part, through a grant agreement from the Florida Department of Agriculture and Consumer Services, Adam H. Putnam, Commissioner of Agriculture. Cao, L, Diana, J. S., & Keoleian, G. A. (2013). Role of life cycle assessment in sustainable aquaculture. Reviews in Aquaculture, 5(2), 61-71. Msangi, S., Kobayashi, M., Batka, M., Vannuccini, S., Dey, M. M., & Anderson, J. L. (2013). Fish to 2030: prospects for fisheries and aquaculture. World Bank Report 83177, 1, 102. Bundschuh, J., Chen, G., Chandrasekharam, D., & Piechocki, J. (2017). Solar, wind and geothermal applications in agriculture: back to the future?. Geothermal, wind and solar energy applications in agriculture and aquaculture (pp. 1-26). Leiden, Netherlands: CRC press. Nash, C. E. (2011). The history of aquaculture. Ames, IA: Wiley-Blackwell. Stickney, R. R. (2010). History of aquaculture In R. R. Stickney (Ed. ), Encyclopedia of Aquaculture (pp. 436-446). Oxford, UK: Wiley-Blackwell. d'Orbcastel, E. R., Blancheton, J. P., Aubin, J. (2009). Towards environmentally sustainable aquaculture: Comparison between two trout farming systems using Life Cycle Assessment. Aquacultural Engineering, 40(3), 113-119. Martins, C. I. M., Eding, E. H., Verdegem, M. C. J., Heinsbroek, L. T. N., Schneider, O., & Blancheton, J. P. (2010). New developments in recirculating aquaculture systems in Europe: A perspective on environmental sustainability. Aquacultural Engineering, 43(3), 83-93. Costa-Pierce, B. A., Bartley, D. M., Hasan, M., Yusoff, F., Kaushik, S. J., Rana, K., . . . Yakupitiyage, A. (2010). Responsible use of resources for sustainable aquaculture: Farming the Waters for People and Food. In R. P, Subasinghe, J.R. Arthur, D.M. Bartley, S.S. De Silva, M. Halwart, N. Hishamunda, C. V. Mohan and P. Sorgeloos (Eds. ), Proceedings of the Global Conference on Aquaculture 2010 (pp. 113-147), Rome: Food and Agriculture Organization of the United Nations and Bangkok: Network of Aquaculture Centres in Asia,18-Pacific. Turcios, A. E., & Papenbrock, J. (2014). Sustainable treatment of aquaculture effluents—what can we learn from the past for the future?. Sustainability, 6(2), 836-856. Pelletier, N., Andre, J., Charef, A., Damalas, D., Green, B., Parker, R., & Watson, R. (2014). Energy prices and seafood security. Global Environmental Change, 24, 30-41. Troell, M., Tyedmers, P., Kautsky, N., & Rönnbäck, P. (2004). Aquaculture and Energy use. Encyclopedia of Energy, 1, 97-108. Forchino A. A., Lourguioui, H., Brigolin, D., & Pastres, R. (2017). Aquaponics and sustainability: The comparison of two different aquaponic techniques using the Life Cycle Assessment (LCA). Aquacultural Engineering, 77, 80-88. Yacout D., M., M., Soliman, N. F., & Yacout, M. M. (2016). Comparative life cycle assessment (LCA) of Tilapia in two production systems: semi-intensive and intensive. The International Journal of Life Cycle Assessment, 21(6), 806-819. Colt, J., Summerfelt, S., Pfeiffer, T., Fivelstad, S., & Rust, M. (2008). Energy and resource consumption of land-based Atlantic salmon smolt hatcheries in the Pacific Northwest (USA). Aquaculture, 280(1), 94-108. Jerbi, M. A., Aubin, J., Garnaoui, K., Achour, L., & Kacem, A. (2012). Life cycle assessment (LCA) of two rearing techniques of sea bass (Dicentrarchus labrax). Aquacultural Engineering, 46, 1-9. Grönroos, J., Seppälä, J., Silvenius, F., & Mäkinen, T. (2006). Life cycle assessment of Finnish cultivated rainbow trout. Boreal Env. Res., 11(5), 401-414. Pelletier, N., & Tyedmers, P. (2010). Life Cycle Assessment of Frozen Tilapia Fillets From Indonesian Lake-Based and Pond-Based Intensive Aquaculture Systems. Journal of Industrial Ecology, 14(3), 467-481. Badiola, M., Basurk, O. C., Gabi-a, G., & Mendiola, D. (2017). Integration of energy audits in the Life Cycle Assessment methodology to improve the environmental performance assessment of Recirculating Aquaculture Systems. Journal of Cleaner Production, 157, 155-166. Cowey C.B., & Cho C.Y. (1991). Nutritional strategies and aquaculture waste. In Cowey, C. B., & Cho, C. Y. (Eds), Proceedings of the First International Symposium on Nutritional Strategies in Management of Aquaculture Waste (pp. 275). Guelph, ON, Canada: University of Guelph. Ioakeimidis, C., Polatidis, H., & Haralambopoulos, D. (2013). Use of renewable energy in aquaculture: an energy audit case-study analysis. Global NEST Journal, 15(3), 282-294. Cho C.Y., & Kaushik S. J. (1990). Nutritional energetics in fish: energy and protein utilization in rainbow trout (Salmo gairdneri). World Rev. Nutr. Dietetics, 61, 132–172. Liao, P. B. (1970). Pollution potential of salmonid fish hatcheries. Water sewage works, 117(8), 291-297. Willoughby, H., Larsen, H. N., & Bowen, J. T. (1972). The pollutional effects of fish hatcheries. American Fishes and US Trout News, 17(3), 6-7. Pelletier, N. L., Ayer, N. W., Tyedmers, P. H., Kruse, S. A., Flysjo, A., Robillard, G., . . . Sonesson U. (2007). Impact Categories for Life Cycle Assessment Research of Seafood Production Systems: Review and Prospectus. The International Journal of Life Cycle Assessment, 12(6), 414-421. Pelletier, N., Audsley, E., Brodt, S., Garnett, T., Henriksson, P., Kendall, A., Kramer, K. J., . . . Troell, M. (2011). Energy Intensity of Agriculture and Food Systems. Annu. Rev. Environ. Resour., 36, 223-246. Larsson, J., Folke., C., & Kautsky, N. (1994). Ecological limitations and appropriation of ecosystem support by shrimp farming in Colombia. Environmental management, 18(5), 663-676. Pauly, D., & Christensen, V. (1995). Primary production required to sustain global fisheries. Nature, 374(6519), 255. Kutner, M. H., Nachtsheim, C. J., & Neter J., Li, W. (2004). Building the Regression Model I: Model selection and validation. In Applied linear statistical models. (pp. 372). New York, NY: McGraw-Hill/Irwin. Boxman, S. E., Zhang, Q., Bailey, D., & Trotz, M. A. (2017). Life cycle assessment of a commercial-scale freshwater aquaponics system. Environmental Engineering Science, 34(5), 299-311. NASO. (2012). National Aquaculture Sector Overview (NASO). Retrieved March 26, 2017 from . Kottek, M., Grieser, J., Beck, C., Rudolf, B., & Rubel, F. (2006). World map of the Köppen-Geiger climate classification updated. Meteorologische Zeitschrift, 15(3), 259-263. Isaac, M., & van Vuuren D. P. (2009). Modeling global residential sector energy demand for heating and air conditioning in the context of climate change. Energy Policy, 37(2), 507-521. Rubel, F. & Kottek, M. (2010). Observed and projected climate shifts 1901 – 2100 depicted by world maps of the Köppen-Geiger climate classification. Meteorologische Zeitschrift, 19(2), 135-141. Henriksson, P. J. G., Zhang, W., Nahid, S. A. A., Newton, R., Phan L.T., Dao, H. M., . . ., & Guinée, J. B. (2014). Results of LCA studies of Asian Aquaculture Systems for Tilapia, Catfish, Shrimp, and Freshwater prawn. Final LCA case study report. SEAT Deliverable D3. 5. SEAT-Leiden University, Leiden, Netherlands, Retrieved June 27, 2017, from . Aubin, J., Papatryphon, E., van der Werf, H. M. G., & Chatzifotis, S. (2009). Assessment of the environmental impact of carnivorous finfish production systems using life cycle assessment. Journal of Cleaner Production, 17(3), 354-361. Ayer, N. W. & Tyedmers, P. H. (2009). Assessing alternative aquaculture technologies: life cycle assessment of salmonid culture systems in Canada. Journal of Cleaner Production, 17(3), 362-373. Bardach, J. (1980). Aquaculture. In Pimentel, D. (Ed. ), Handbook of Energy Utilization in Agriculture (pp. 431-440). Boca Raton, Florida: CRC Press. Costa-Pierce, B. A. (2002). Ecology as the Paradigm for the Future of Aquaculture. In Costa-Pierce (Ed. ), Ecological Aquaculture: The Evolution of the Blue Revolution (pp. 339-372). Oxford, United Kingdom: Blackwell Science. Costa-Pierce, B. (2010). Sustainable ecological aquaculture systems: The need for a new social contract for aquaculture development. Marine Technology Society Journal, 44(3), 88-112.
d'Orbcastel, E. R., Blancheton J. P., & Aubin, J. (2009). Towards environmentally sustainable aquaculture: Comparison between two trout farming systems using Life Cycle Assessment. Aquacultural Engineering, 40(3), 113-119. Ellingsen, H., & Aanondsen S. A. (2006). Environmental Impacts of Wild Caught Cod and Farmed Salmon – A Comparison with Chicken. Int. J. LCA, 11(1), 60-65. Eding, E., & Kamstra, A. (2002). Netherlands Farms Tune Recirculation Systems to Production of Varied Species. Global Aquaculture Advocate, 5(3), 52-55. Folke, C. (1988). Energy Economy of Salmon Aquaculture in the Baltic Sea. Environmental Management, 12(4), 525-537. Gál, D., Pekár, F., Kerepeczki, E., & Váradi, L. (2007). Experiments on the operation of a combined aquaculture-algae system. Aquacult. Int., 15(3), 173-180. Kerepeczki, É., & Pekar, F. (2005). Nitrogen dynamics in an integrated pond-wetland ecosystem. Internationale Vereinigung für theoretische und angewantdte Limnologie: Verhandlungen, 29(2), 877-879. Lebel, L., Mungkung, R., Gheewala, S. H., & Lebel, P. (2010). Innovation cycles, niches and sustainability in the shrimp aquaculture industry in Thailand. Environmental Science and Policy, 13(4), 291-302. Larsson, J., Folke, C., & Kautsky, N. (1994). Ecological limitations and appropriation of ecosystem support by shrimp farming in Colombia. Environmental management, 18(5), 663-676. Mungkung, R. (2005). Shrimp Aquaculture in Thailand: Application of Life Cycle Assessment to support sustainable development. (Doctoral dissertation). Centre for Environmental Strategy (CES), School of Engineering, University of Surrey, United Kingdom. NASO (2012). National Aquaculture Sector Overview (NASO). Retrieved March 26, 2017 from . Pillay, T. V.R. (1990). Aquaculture Principles and Practices. Oxford, United Kingdom: Fishing New Books. Samuel-Fitwi, B., Nagel, F., Meyer, S., Schroeder, J. P., & Schulz, C. (2013). Comparative life cycle assessment (LCA) of raising rainbow trout (Oncorhynchus mykiss) in different production systems. Aquacultural Engineering, 54, 85-92. Shang, Y. C. (1992). Penaeid markets and economics. In Fast, A. W., & Lester, L. J. (Eds. ), Marine Shrimp Culture: Principles and Practices (pp. 589-604). Amsterdam: Elsevier. Stewart, J. A. (1995). Assessing Sustainability of Aquaculture Development. (Doctoral dissertation). University of Stirling, United Kingdom. Sun, W. (2009) Life Cycle Assessment of Indoor Recirculating Shrimp Aquaculture System. (Master's thesis). University of Michigan, Ann Arbor, Michigan. Tiwari, G. N., & Sarkar, B. (2006). Energy Inputs and Fish Yield Relationship for Open and Greenhouse Pond. Journal of Fisheries and Aquatic Science, 1(2), 171-180. Tyedmers P. H. (2000). Salmon and Sustainability: The Biophysical Cost of Producing Salmon Through the Commercial Salmon Fishery and the Intensive Salmon Culture Industry. (Doctoral dissertation). University of British Columbia, Vancouver, Canada. Waldrop, J. E., & Dillard, J. G. (1985). Economics. In Tucker, C. S. (Ed. ), Channel Catfish Culture (pp. 621-645). Amsterdam: Elsevier. Westoby, M., & Kase, R. T. (1974). Catfish farming and its economic feasibility in New York state. Unpublished manuscript, Ithaca, NY. Note: RAS is a recirculating aquaculture system, FU is the functional unit, “na” indicates not available, and “-” represents the information was omitted due to the confidentiality. Future global aquaculture growth scenarios were adapted from Delagado et al. (2003) and Msangi et al. (2013). Expected annual average growth rates of aquaculture by different regions or group of countries were also obtained from their studies (Table S2). 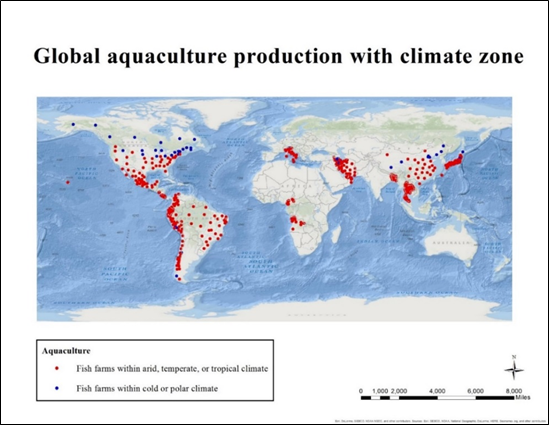 For future scenarios, it was assumed that there was no change in species, culture technology, and system intensity used for the current global aquaculture, except for the scenario of innovative and environmentally friendly growth, which was the addition of extensive land-based culture technology to meet 30% of the total fish demand in each country. Therefore, only a proportion of fish production (mass of production) from each production case in a country was changed depending on scenarios. Energy demands were calculated for each of the global aquaculture production elements in five different scenarios to 2025 based on several assumptions. This involved the 23 combinations of aquaculture systems in 2015 based on the NASO map (NASO, 2012). Total global aquaculture production is approximately 48,708,952 metric tons/yr. This scenario assumes no change in species and production methods. All aquaculture businesses would be equally expanded during the 2015-2025 period. Aquaculture production in 2025 is 64,455,978 metric tons/yr. Annual growth rates of aquaculture for each region were obtained from Delagado et al. (2003) and Msangi et al. (2013). This scenario assumed there would be an active information sharing on culture technology for improving production efficiency around the globe, such as improvements in feed conversion ratio and water quality management skills, etc. These would allow fish farms to be more intensive. Therefore, a 3% annual growth rate of the proportion from intensive systems around the globe was assumed. Other systems using semi-intensive or extensive systems were annually diminished in a proportional manner. Total aquaculture production in 2025 is 64,455,978 metric tons/yr. This scenario assumed that the active information sharing on culture technology for improving production efficiency would only occur in developed countries. Therefore, it was assumed that the intensive systems would increase in developed countries by a 1% of annual growth rate, while semi-intensive or extensive systems would increase in developing countries by a 1% of annual growth rate. Total aquaculture production in 2025 is 64,455,978 metric tons/yr. China has currently the largest share of aquaculture production (about 62% of the total aquaculture production in 2012) showing a notable annual growth rate (FAO, 2014). According to Msangi et al. (2014), China in 2030 is expected to produce about 58% of aquaculture production while accounting for 38% of global consumption of food fish. Considering this, China will increasingly impact on the global fish markets. This scenario investigated how fish production in China might affect the energy demand of the global aquaculture. It was assumed that intensive systems in China would be expanded by a 3% of annual growth rate, while fish production from semi-intensive or extensive systems would be declined in a proportional manner. Total aquaculture production in 2025 is 64,455,978 metric tons/yr. This scenario assumed that advances in technology and management of land-based technologies. It was assumed that the integration of extensive systems into intensive land-based culture systems could contribute to improvements in resource use efficiency and water quality management. For instance, wetland systems were used to treat effluents from intensive fish farms (Costa-Pierce, 1998). Also, a combination of aquaculture and algae system was suggested by treating the effluents of intensive fish production in an extensive algal pond (Kerepeczki & Pekar, 2005). The systems would allow aquaculture to reduce water and environmental burdens while maintaining a high production yield. By assuming that these integrated intensive-extensive systems would be more promoted, it was assumed that 30% of the fish demands in countries were met by the combined extensive-intensive (extensive in the manuscript) land-based technologies. Total aquaculture production in 2025 is 64,455,978 metric tons/yr. Figure S4 shows diagnostic residual plots against each predictor and fitted values and a normal probability plot. None of these plots suggested any gross inadequacies of the regression model. The coefficient of correlation between the ordered residuals and their expected values is 0.982. With 42 data, the critical value for the coefficient of correlation, between the ordered residuals and their expected values under normality is 0.972 at a 0.05 significance level (Looney et al., 1985). Since the coefficient of correlation between the ordered residuals and their expected values (0.982) was greater than 0.972, the assumption of normality was reasonable. Interaction effect between X3 and X4 is significant at 0.05 of a significance level. X2 39.62 20.57 1.926 0.062051 . Since the result showed that X1 and X2 are not significant, the Boxcox transformation was used. Conclusion: The possible values of lambda for the Boxcox transformation were -0.5 and 0. Since values of R2 and adjusted R2 with a lambda of -0.5 were higher than those with a lambda of 0. Therefore, observations were transformed with a power of -0.5 and the interaction effect between X3 and X4 was not significant at a 0.05 of significance level. Therefore, the fitted regression model is, as shown in lm5 of R result above, Y = 0.1488 – 0.01782X1 – 0.02765X2 – 0.03735X3 – 0.01927X4. No outliers and significant lack of fit were identified.